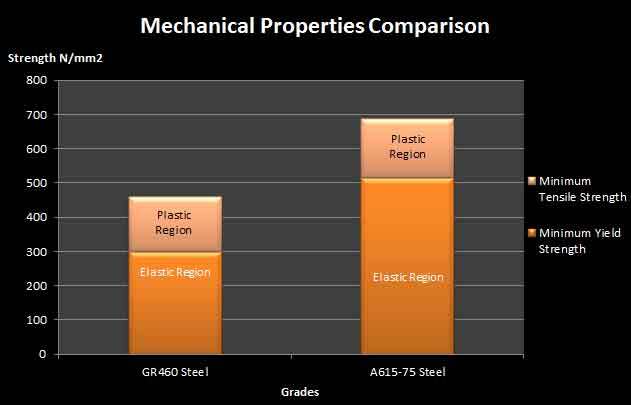 What is GR460 Grade Steels? 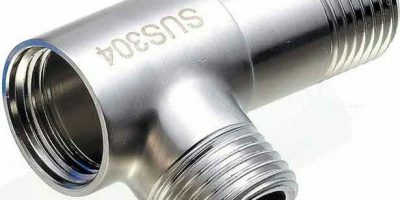 GR460 grade steel is a structural billet steel for structural applications. GR460 grade is a material grade and designation defined in BS4449 standard. BS4449 is a British material standard for Carbon Steel Bars for Concrete Reinforcement for strengthening application. 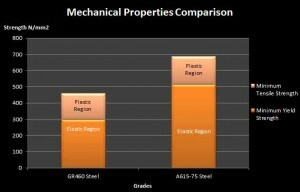 GR460 grade Steel is lower in strength as compare to A615-75 steel. Dimensional Characteristics of GR460 Grade Steels: The nominal size for this GR460 GRADE material as defined in the BS4449 ranges to 8-40 mm. The cross sectional area is about 50-1963 mm2. 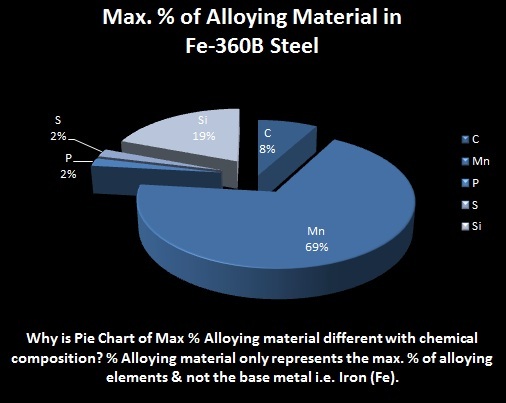 Remaining is iron (Fe) percentage and with few other alloys and negligible impurities. Mechanical Properties of GR460 Grade Steels: The tensile strength of the GR460 Grade Steels is expressed in Newton per millimeters and it must be at-least 460 N/mm2 (MPa). The yield strength is not identified. The minimum percentage ranges for elongation is 12% thicknesses. This material is used in civil engineering constructions like Housing, Bridges, & roads.